Outsource2india offers consistent innovation and the highest level of engineering drawing support for home developers, builders, and architects. With new levels of safety standards and building regulations making it crucial for home developers to meet all specifications at the concept and drawing stage, our team of drafters and modelers provide the much-needed support for both large and small projects. Every project is given well-deserved attention to detail, and Outsource2india understands the unique requirements of each project to provide finest detailings right from the conceptualization to the drawing stage. Outsource2india has been a pioneer in the field of engineering support services for over two decades with a growing list of clients from across the globe. With a global delivery model, stringent quality process, understanding of all international building regulations, and customer-centric approach, we offer qualitative design & analysis services at cost-effective prices. Construction Documentation - Outsource2india helps you to create a comprehensive list of construction documents required for planning, analysis, and execution. These documents support home builders, architects, and contractors to keep track of sequential data of floor plans, elevations, ceiling plans, etc., for a smoother construction process. SketchUp Modeling - Our SketchUp Modeling artists create 3D models of your architectural drawings and renderings and help you to convert ideas into reality. Our team of creative team drafter and engineers provide smarter SketchUp modeling services for projects irrespective of scale, size, and volume. Interior Design - Outsource2india's interior designing services for custom homes help home developers to materialize concepts in a more viable and practical manner. Our skilled team of drafters and engineers convert 2D CAD designs into 3D models and 3D renderings, 3D photo-hybrid-fusion and 3D sectional views of the 3D model with a photograph of any site, that depict different points of view, to create a virtual panorama to provide an interactive experience. 2D CAD Drafting - Our 2D drafting services help in managing designs, configuration of changes and addition of geometric dimensions, list out tolerance information, preparation on associate notes, as well as for annotations and Bill of Material (BoM) purposes. Outsource2india's 2D CAD drafting services enable architects, engineers, real estate developers, and consultants reduce drawing and drafting time. 3D Rendering - We offer 3D rendering services to help create presentations, models, as well as animations with detailed visuals carrying intricate detailing of texturing and light elements in commercial, residential, and industrial environs. 3D Architectural Walkthrough - Outsource2india provides 3D Architectural Walkthrough services for customer homes to give a realistic 3D view of the concepts to understand the designs better. Our virtual room design services add to the aesthetic appeal of any home design. Landscape Design & Drafting - With appealing landscape designs, you can create compelling home designs that can give a boost to your marketing strategies. 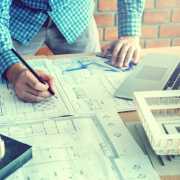 We offer master planning and design, site analysis, as well as evaluation, project management and cost estimation that ultimately help to make your marketing process a hit. Building Information Modeling (BIM) - We offer technology and expertise to meet end-to-end BIM service requirements. Our skilled engineers use all latest technologies including Autodesk Revit to draw detailed designs to help home developers and architectural companies. While BIM services provide a holistic perspective on how to handle the project in a more flexible and smooth manner, we help you to collaborate with clients, vendors, design professionals, suppliers as well as building contractors to streamline the construction process. Outsource2india understands that home development projects are crucial to increasing number of stakeholders being involved as well as the home owners becoming extremely demanding. We help you manage your investment and maximize the returns. If you have decided on outsourcing custom home design and analysis to India, look no further. Contact us today to understand how we can help you make your home development project a success.